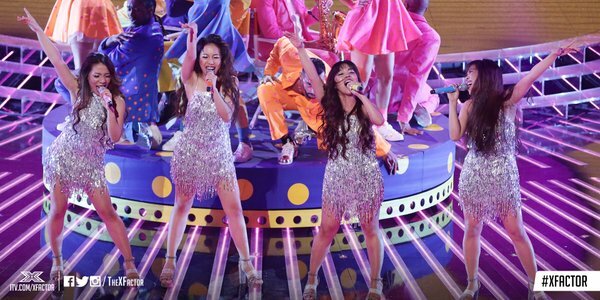 MANILA, Philippines - Filipino girl group 4th Impact, formerly known as 4th Power received standing ovation from the judges as they performed Beyonce's 'Work It Out' on X Factor UK Third Live Shows on Saturday, November 14 (Sunday morning in Philippine Time). 4th Impact which is among the seven remaining contestants of the hit competition is composed of siblings Mylene, Celina, Irene and Almira Gollayan from Santiago City, Isabela. After the show-stealing performance, Celina felt dizzy which caused panic among the judges and viewers. The group mentor Cheryl Fernandez-Versini announced that she had passed out before the live show. "One of my little dollies, Celina, has passed out and was taken in an ambulance," she said. Cheryl added that the group chose to perform instead of the offered opportunity to play the [recording of the] dress run given the condition of Celina. X Factor host Olly Murs rushed on the stage to check her condition. Judge Simon Cowell advised her to rest off-camera. However, the judges were impressed on their performance despite Celina's illness. "That is what stars do - we suffer things like this… There's things that you have to just do and you girls did that tonight," Cheryl commented. "That was a really inspiring performance. Celina you're my hero tonight so well done," Rita Ora said. Catch the X Factor UK results night (double elimination) on ITV1 on Sunday, November 15 at 8PM ( 4AM Monday on Philippine Time). ITV1 is available on Channel 53 (SD Digital) and Channel 196 (HD) SkyCable and Destiny, Channel 37 (SD Digital) and Channel 313 (HD Digital) on Cablelink and Channel 51 (SD Digital) on Mindanao Cable.